It is hard to even count how many times the subject of “why do the innocent suffer?” comes up in conversations. The nicest people seem to be the ones who suffer from cancer. Why do sweet children ever have to suffer? Why does it seem that evil can have the upper hand torturing and murdering ones who follow the true living God? The measuring stick that brings me comfort and hope when asking the darkest questions of this life is Jesus. 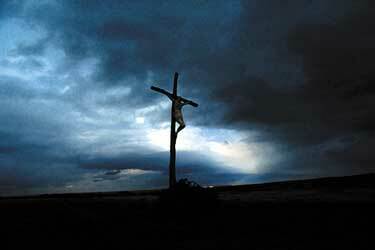 When I look at what He endured on that cross for us it brings about a whole different perspective. We often think of how undeserving the suffering of so many innocent lives actually is. There has never walked a human being on this earth more undeserving of suffering than Jesus Christ, the Son of God, God in the flesh, fully human yet fully God, perfect and sinless. Why would God do that? Why would He come to earth to be rejected, tortured, and murdered? Did you ever think that what He has planned beyond this life on earth for those who believe in Him is totally worth any suffering we face in our short lifetime? He conquered sin and death by dying and proved that He is God by rising on the third day just as He said. He fulfilled all prophecy and has kept every promise thus far. Do you think the promise of eternal life is where the true blessing is at? I do. When I compare everything to the cross nothing ever measures up to Jesus.